Bernadette Jiwa is one of my professional heros. The woman speaks my language... or perhaps it's me that speaks hers, since she's influenced Stark & Splendor in so many ways through the gold that she posts on her blog, The Story of Telling. She was the first marketing expert that articulated what I intuitively knew to be true: love and empathy are, in fact, some of our most powerful strategies for winning in today's noisy, cluttered, staticky digital world. The most recent gold that Bernadette has dropped into my lap is her newest book, Meaningful: The Story of Ideas That Fly. The basic premise is that we as marketers and business owners often approach the innovation process backwards. We tend to start with an idea that we love, and then spend our budgets (and break our backs) trying to get others to love it too. All the while we think, "there must be an easier way!" Meaningful charts out the path of lesser resistance. What if we started with the customer's story? What if we understood what was meaningful to them and only created in alignment with that insight? What would innovation look like? How would our marketing change? "Just as the best stories change the people who encounter them, the brands businesses, movements, products and services that succeed by being meaningful change people too. There is a life and a way of being before the product or service existed, and a life and a way of being after it." "...if there is no change in the customer, there is no innovation." Attraction --> Affinity --> Action"
"When we encourage people to believe that something matters, we attract the kind of people who care about that something. Soon buying from us becomes part of their identity--their story. The experience--our posture and products, and the story the business owner is inviting the customer to buy into--is what creates the customer." "We have come to care about all parts of the buying journey as much as we care about ownership." Give them a story to tell. "People...want to become invested in the businesses and brands that they choose to support, and they want those brands to be a part of the stories they tell both to and about themselves." "I'm here to tell you that giving a damn is seriously underrated and caring is a competitive advantage." How legit is this woman? I could go on and on sharing excerpts, but the most practical part of the book is Bernadette's framework for "giving a damn." It's called The Story Strategy, and in Meaningful she models how to use it by applying it to the innovation journey of a bunch of wonderful brands that we all know and love...Go Pro, Canva, Harry's, and Khan Academy, to name a few. The Story Strategy can be applied to product R&D and organizational strategy, but it's also so instructive for specific marketing communications campaigns, copywriting or content creation. I've been using it a lot and have found it to be a wonderful tool for getting me focused on the customer's story first and foremost. I would heartily recommend this book to anyone that is a student of branding and/or is intent on creating things of consequence in this world. Have you read Meaningful? What'd you think? What's currently on your nightstand? Re-thinking Mission & Embracing Purpose. Today I want to talk about one of the most important aspects of assembling your brand messaging: purpose. Purpose is at the top of the agenda when I sit down with clients to craft their messaging and it’s a great topic to revisit at the beginning of the year. Purpose is the “why” that lends meaning to the “what” of what you do. Purpose reveals your motives, and motives are important because they reveal your values. Besides the tangible solutions you offer through your products and services, values are the #1 thing your audience buys when they buy you. If your values [as revealed by your purpose] align with your audience’s, then the skies are the limit to what you can build with your customers! So, it goes without saying that defining your purpose is hugely important. Like a compass points a captain to true north, a crystal clear purpose points to the ideas, innovations, and intentions you should pursue to make your customers' lives better. Having a purpose and having a mission statement are two different things. I bet you’ve seen hundreds of these! At best they're a bore, at worst they're empty words. Don’t get me wrong: codifying your day-to-day mission is very important for your internal audiences. It gets everyone on the same page, and that's a worthy goal. But no one ever waited in line for 12 hours on release day, or edited a fanzine, or hosted a viewing party, or bought the t-shirt for a brand that was purposeless, but awesome. Nope. Customers bend over backwards for a brand only when they feel connected to its purpose and aligned with its values. Perhaps this is why I’ve noticed more and more organizations de-commissioning tired ol’ mission statements from their websites in favor of purpose-driven language instead? If you’ve never thought about your organization’s purpose or haven’t revisited your “why” in a long time, then this is my A-1 tip for strengthening your brand. Give yourself a few days to answer these questions to flush out your purpose and uncover your "why." What do your customers want to do that they either can’t do or find difficult to do? Why do you want to fix that? Why are you the one(s) to take this on? What happens if you succeed? What difference will it make? What do your customers believe about the world? – Life, love, happiness, truth, etc. What do you know for certain that you wish everyone could know? If everyone knew what you know, how would the world change? Mull these over and write down your answers. It doesn't matter if they're messy or nonsensical at first. Just get them down on paper. When you’re ready, take a stab at writing a statement of purpose that hits on the six elements in the Mission vs. Purpose graphic above. - Don’t be overly formal. - Have fun with the words, phrases, or word-pictures that you use. - Play around with tone. Is your brand optimistic, maverick, pensive, blunt, feminine, masculine, aspirational? Insert tone-specific words to stay on-brand. - Keep it short and sweet. Meaningful doesn't have to be long. - Lastly, don’t rush to put your statement up on your website – sit with it for a few days and think about how you can let this language shape how you talk about your products, services, and brand. Need Some Help Clarifying Your Purpose? This series is a great primer but if you want one-on-one support for crafting your brand messaging, the Articulation Intensive might right for you. In this 4-to-6-week program your and I will craft words and ideas that express your brand's purpose and personality. To chat about your brand messaging needs, contact me at steph@starkandsplendor.com. Stark & Splendor exists to help visionaries materialize their big ideas. An awesome by-product of this work is that I get to meet, work with, and learn from some ridiculously savvy professionals who are about making meaning in this world. Far be it from me to keep all of this inspiration to myself! I thought it would be cool to introduce you to some of these world changers in this new Q & A series, Meet the Visionary. Today I have the privilege of introducing you to visionary Rosalie Audoin, the founder and CEO of London-based beauty company Dielle UK. A recent Articulation Intensive client, Ros completely blew me away with her passion for revolutionizing the beauty industry with her message of "essentialist beauty." In this interview she talks about what that means to her, and shares about her path to creative entrepreneurship. Welcome to The Ampersand, Ros! Let's take it back to your childhood. As a girl, what did you want to be when you grew up? Ever since I can remember I've always wanted to be an entrepreneur. When I was 8 I lived in Puerto Rico and there was a big mango tree in my parents' backyard. Every summer the mangos would fall to the ground. I would pick the nice looking ones and take them around to my neighbours in a little basket [and sell them] for 10 cents each. Then I'd gather my friends and go to Don Mario's sweet shop, which was around the corner, and we'd have a feast! I used to dream of being a real business woman from a very young age. My mom, who's always been my ultimate cheerleader, bought me a huge calculator once and it was definitely one of the favourite gifts I received as a child because I thought "every business women needs a calculator." I also wanted to be a teacher because I love to share knowledge and encouragement. I lived in Haiti for a few years and saw there that education and insight literally change people's lives. What led you to start Dielle? A massive change in life! After having my son I went back to work when he was 6 months old, and the year that followed proved to be very difficult for me. I constantly felt torn about leaving him with nannies. Managing my very busy schedule was a real struggle. My husband travelled a lot as well, and when I had evening functions I sometimes didn't see my son for days. One day I decided to make some changes which would make my season with a small child more effective. It was a tough decision but I quit my job (and I'm so thankful that I could do that) to start something new whilst working from home. My background was in finance and in the charity sector, but I loved the beauty industry and dreamed of creating a brand that could inspire and reshape some beliefs spread in this sector that [I believe] are damaging to women's souls. So I started Dielle and it's been the best journey I've ever embarked on. How did you overcome the fear that comes with having your own business? I haven't overcome that fear yet! Ha! I just do it anyway. It's a constant theme that I need to address. I was surprised to find out as I spoke to other entrepreneurs that's it's totally normal and most entrepreneurs experience fear in one way or another. Stepping into the unknown, putting yourself out there, making mistakes while the world is watching -- you don't always get to rehearse and correct your mistakes before the "show." What's been the most challenging part of establishing a beauty brand? Dielle was made of many pieces that, unlike a puzzle, did not really fit together easily. Initially, there was a lack of cohesiveness between different aspects of the business. The message of the brand, which is what makes Dielle unique, lacked clarity. I just couldn't seem to express it in a way that made sense. In my head it was clear but it wasn't communicated clearly to my customers. Your new brand tagline is "Essentialist Beauty." What does this mean to you?
. We are not driven by trends and consumerism, but instead we want to remind women to pursue meaning and authenticity in their lives. What's your vision for the beauty industry and the impact Dielle will have on women's lives? I want Dielle to be a brand that opens women's eyes and really helps them see themselves as the beauties that they truly are. I want women to know that their lives matter and that beauty products only exist to enhance what they already have! I dream of seeing a movement of women who stand confidently, focused on things that really matter instead of being distracted by illusive beauty ideals or by the undisciplined pursuit of more or "better." You recently went through the Articulation Intensive. How did it impact the way you are building Dielle? Did you learn anything about yourself through the experience? This was such as turning point for us as a brand. You have a very special gift: the capacity to create cohesion and coherence. You were able to grasp what I was trying to say and make it plain with exceptional clarity. The program forced me to take some time to think and really create a visual representation of what the brand is meant to look like. I hadn't done that since the pre-start up phase and I realised that the business today, was not at all what it was before we launched. That's a good thing, but we needed to articulate what Dielle has become and where we are heading. I also learned that I can no longer hide behind the brand, which I still find challenging but I'm slowly learning that it's the only way to build Dielle with authenticity and integrity. The program taught me that people buy from people -- not just a company with a logo and a product. Thank you, Ros! I'm elated that you can say those things about our work together! What's inspiring you creatively right now? I'm currently working on the calendar for next year and I am particularly excited about creating more ways to spread the Dielle message through our products, services and events! What's a piece of advice you would give to other visionary women starting out in the beauty industry? There is a seat at the table for you, take your place and confidently bring to the table what only you can bring! Thank you Ros! And thank YOU for reading. 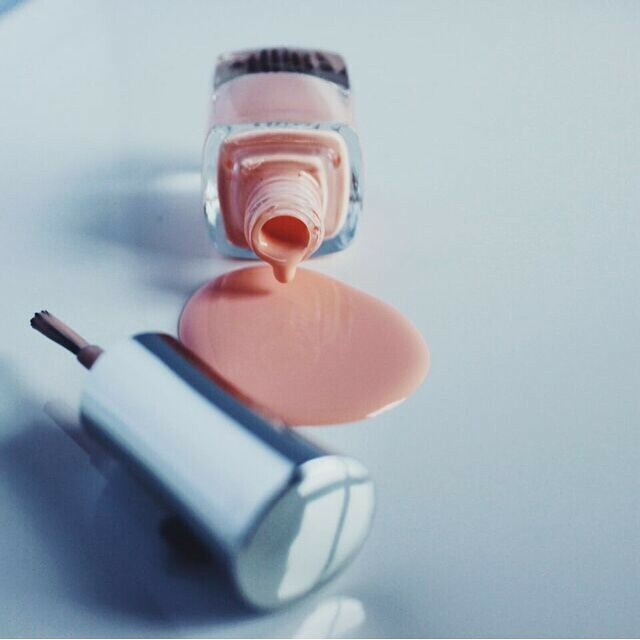 To find out more about Ros' essentialist beauty philosophy and her stellar line of creamy, dreamy nail polish essentials, visit www.dielle.co.uk or follow along on Instagram @dielleuk.